This month’s challenge involved crafting a puff pastry that incorporated a block of butter. This is yet another DB challenge that will be chalked up to the list of things I never, ever would have attempted to make due to the recipe’s most decidedly non-vegan attitude and sneer had it not been for my fellow DBers pushing me into new, uncharted vegan baking territory. And that is why I love the Daring Bakers. 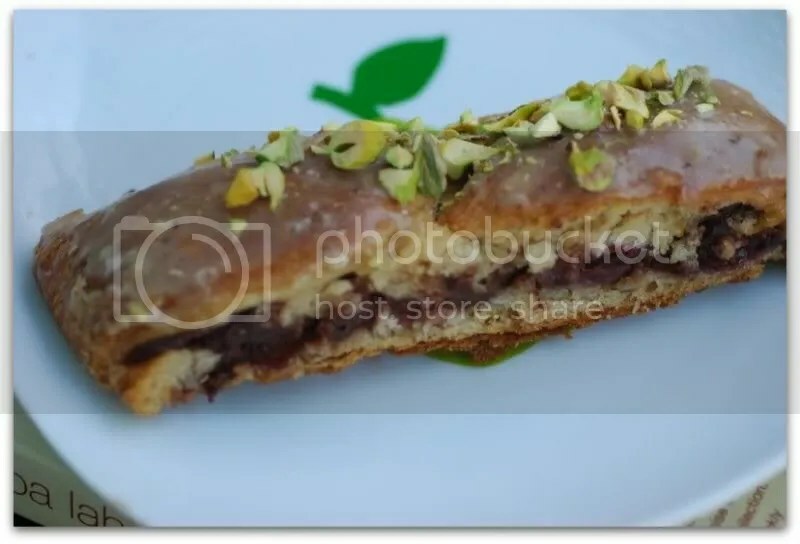 The original recipe called for an apple filling, but I wanted something more seasonal so I made a chocolate cherry cream cheese filling, which I thought paired well with the mild flavor of orange and cardamom in the dough. 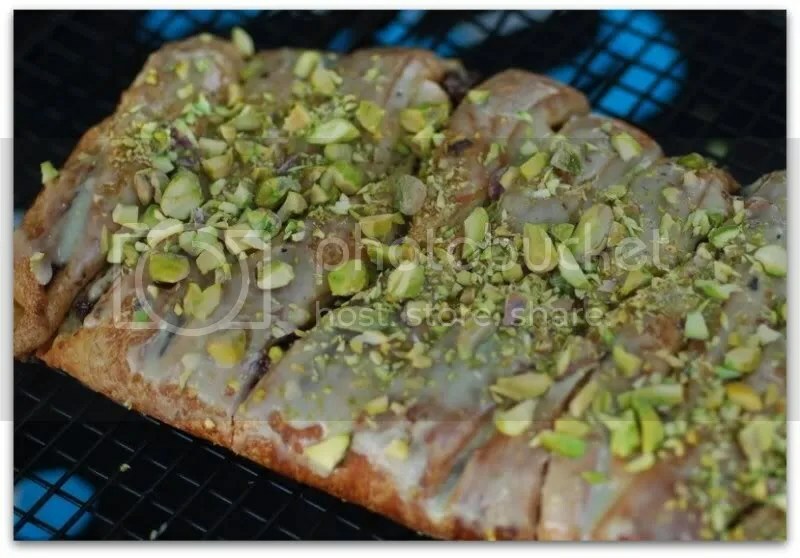 I topped the braid with an orange glaze and chopped pistachios. Mahalo to Kelly of Sass and Veracity and Ben of What’s Cookin’? for hosting this month’s challenge. 1. Combine yeast and soy milk in a bowl with a hand mixer on low speed or a whisk. Add sugar, orange zest, cardamom, vanilla extract, soy yogurt, and orange juice and mix well. 2. Sift flour and salt on your working surface and make a fountain. Make sure that the “walls” of your fountain are thick and even. Pour the liquid in the middle of the fountain. With your fingertips, mix the liquid and the flour starting from the middle of the fountain, slowly working towards the edges. (Add more flour as necessary. I used an additional 1/3 cup flour in this step). When the ingredients have been incorporated start kneading the dough with the heel of your hands until it becomes smooth and easy to work with, around 5 to 7 minutes. You might need to add more flour if the dough is sticky. Refrigerate for 30 minutes. 3. While the detrempe is chilling, combine Earth balance and flour in the bowl and beat on medium speed for 1 minute. Scrape down the sides of the bowl and then beat for 1 minute more, or until smooth and lump free. Set aside at room temperature. 4. After the detrempe has chilled 30 minutes, turn it out onto a lightly floured surface. Roll the dough into a rectangle approximately 18 x 13 inches and 1⁄4 inch thick. The dough may be sticky, so keep dusting it lightly with flour. Spread the beurrage evenly over the center and right thirds of the dough. Fold the left edge of the detrempe to the right, covering half of the butter. Fold the right third of the rectangle over the center third. The first turn has now been completed. Mark the dough by poking it with your finger to keep track of your turns, or use a sticky and keep a tally. Place the dough on a baking sheet, wrap it in plastic wrap, and refrigerate for 30 minutes. 5. Place the dough lengthwise on a floured work surface. The open ends should be to your right and left. Roll the dough into another approximately 13 x 18 inch, 1⁄4-inch-thick rectangle. Again, fold the left third of the rectangle over the center third and the right third over the center third. No additional Earth Balance will be added as it is already in the dough. The second turn has now been completed. Refrigerate the dough for 30 minutes. 6. Roll out, turn, and refrigerate the dough two more times, for a total of four single turns. Make sure you are keeping track of your turns. Refrigerate the dough after the final turn for at least 5 hours or overnight. The Danish dough is now ready to be used. If you will not be using the dough within 24 hours, freeze it. To do this, roll the dough out to about 1 inch in thickness, wrap tightly in plastic wrap, and freeze. Defrost the dough slowly in the refrigerator for easiest handling. Danish dough will keep in the freezer for up to 1 month. Use hand mixer to mix together the Tofutti, confectioner’s sugar, and cocoa until smooth. Mix in the vanilla until well blended. Fold in the cherries. 1. Line a baking sheet with a silicone mat or parchment paper. On a lightly floured surface, roll the Danish Dough into a 12 x 20-inch rectangle, 1⁄4 inch thick. If the dough seems elastic and shrinks back when rolled, let it rest for a few minutes, then roll again. Place the dough on the baking sheet. 2. 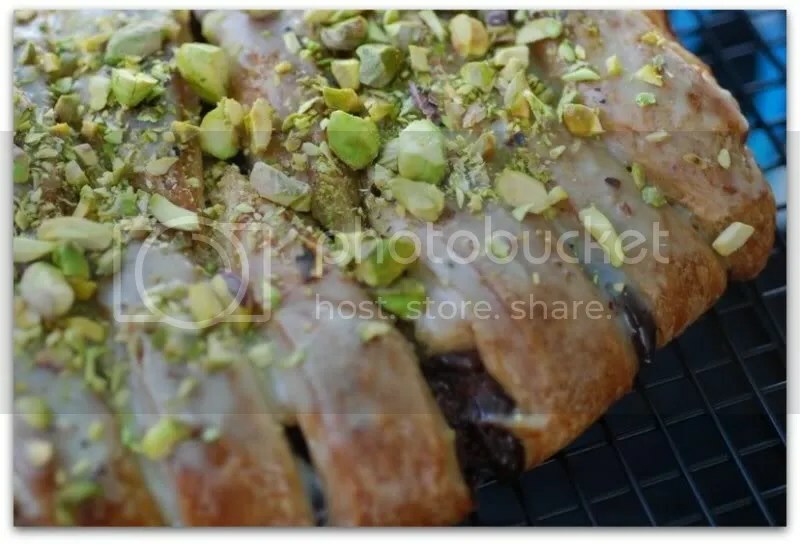 Along one long side of the pastry make parallel, 4-inch-long cuts with a knife or rolling pastry wheel, each about 1 inch apart. Repeat on the opposite side, making sure to line up the cuts with those you’ve already made. 3. Spoon the filling down the center of the rectangle. Starting with the top and bottom “flaps”, fold the top flap down over the filling to cover. Next, fold the bottom “flap” up to cover filling. This helps keep the braid neat and helps to hold in the filling. Now begin folding the cut side strips of dough over the filling, alternating first left, then right, left, right, until finished. Trim any excess dough and tuck in the ends. 4. Brush a bit of melted Earth Balance over the top of the braid. 1. Spray cooking oil (Pam) onto a piece of plastic wrap, and place over the braid. Proof at room temperature or, if possible, in a controlled 90 degree F environment for about 2 hours, or until doubled in volume and light to the touch. (I proofed min in my oven set at 90F). 3. Bake for 10 minutes, then rotate the pan so that the side of the braid previously in the back of the oven is now in the front. Lower the oven temperature to 350 degrees F, and bake about 15-20 minutes more, or until golden brown. Cool on a wire rack. Brush glaze over braid. 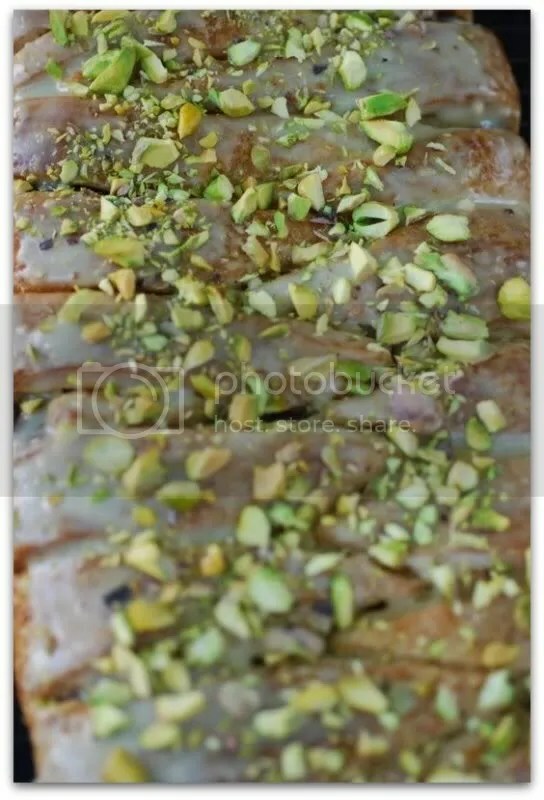 Sprinkle with ½ cup chopped pistachios. Slice the braid, reheat in microwave, and serve warm. Or don’t microwave it and serve at room temperature. Either way, it’s delicious. Great job and glad the Daring Bakers are challenging you to try more things with vegan recipes! Mmmm….pistachios. 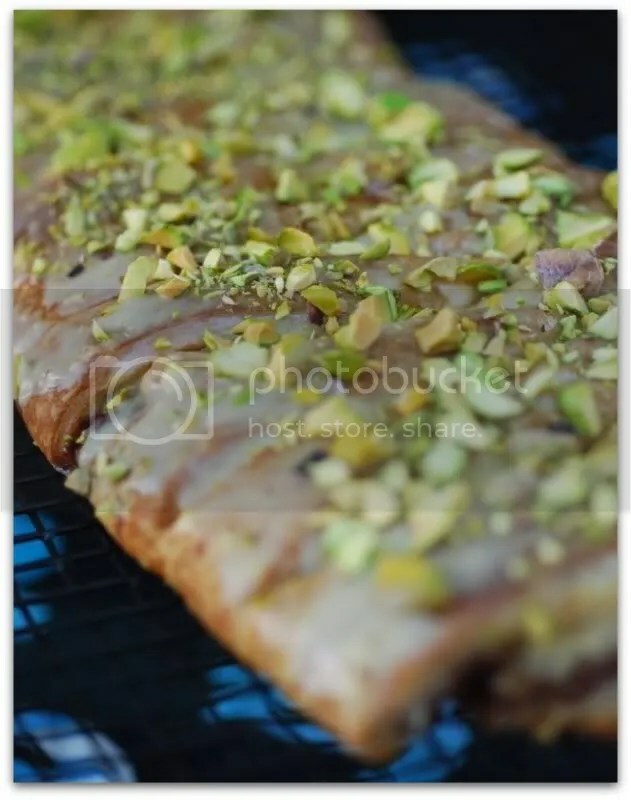 Great idea to do a glaze. That is just what was missing from my braid. I’m so glad you did it- it looks great and I love your flavor choices! chocolate cherry cream cheese filling? yes, please. GREAT braid. Thanks for sharing. 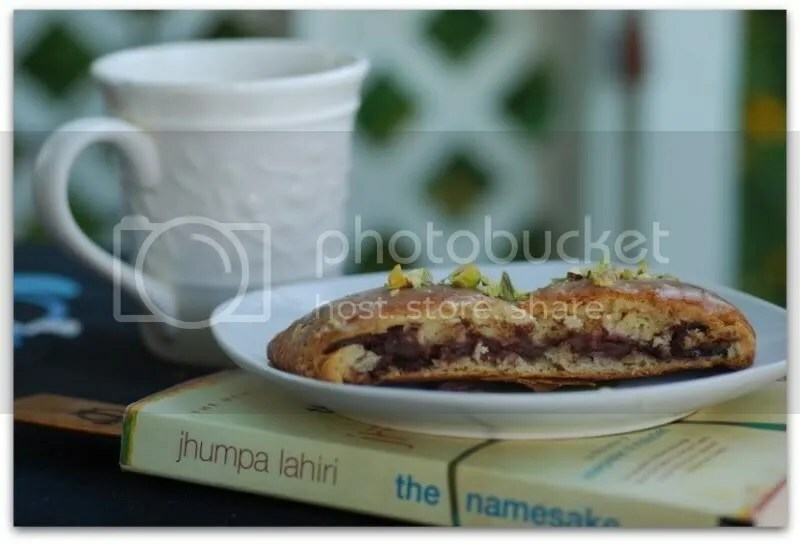 I don’t participate in Daring Bakers, but I have my one little ‘trick’ to try new things: every month, I pick two cookbooks (I have a lot of them…) and make at least two recipes out of each book (if I can’t even find two recipes I want to make, I’m going to give it away). That way, I try new recipes, new ingredients and try out different ‘styles’ of cooking. One of the cookbooks I didn’t use is now actually one of my favorites. Nice braid. It fascinates me how folks veganize and gluten-free these recipes. That requires some creativity. Ooo, your braid looks so good! Chocolate and cherry, I have my fork ready! Are you kidding me? That looks so incredible AND it’s vegan!? You alternative DBers are so amazing. Hats off to you! Just gorgeous braids!! What a fancy and delicious looking bread! Mmmm! i’m salivating…this looks so darn good…oh my. 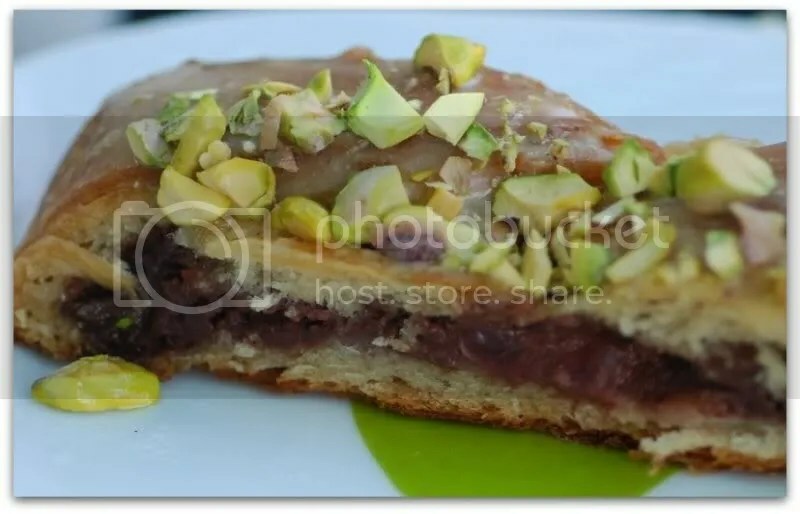 the pistachios alone…i want to try your filling recipe, sounds so good…although my hubby doesn’t like cherries, i’ll have to try and swap it out. great job and your pictures are beautiful! I love it! My 2nd braid (which I haven’t posted yet) was chocolate cream cheese pistachio filling! The vegan cream cheese and chocolate idea is golden. Your braid looks great!